The American Staffordshire terrier is a highly intelligent dog breed which is known for its amazing guarding skills. 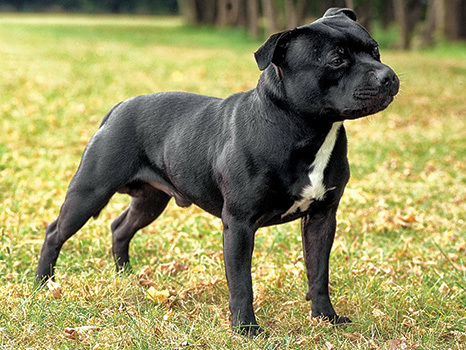 This breed is also known as Amstaff, and was first bred in England. These outstanding dogs have characteristics of two very amazing dog breeds; bulldogs and Fox Terrier, White English Terrier, or the Black and Tan Terrier. Although this dog shares many similarities with bulldogs and white English terriers, they differs on the basis of their high spirit and color. The American Staffordshire terrier is a muscular and large breed. They are known for their strong appearance, which can be intimidating for many people. However, despite their powerful presence, these dogs carry themselves with a lot of grace. Furthermore, this dog has a beautiful, shiny and short coat, which makes it look much more appealing. Their coat is of two main types – patched or solid. The American Staffordshire terrier is also regarded as a protective dog, which makes them great for keeping their owners safe. Their jaws are also extremely powerful, which makes it hard for any attacker to escape. Although the American Staffordshire terrier is one of the best protection dogs, it has a very sweet and kind nature. If you own this dog, then you will be showered with love, care, and affection all the time. They love to play around and learn new things and will socialize with strangers in the presence of their owners. These dogs can be a little tricky to train, but if you are patient and consistent, they can turn into amazing protection dogs. However, these dogs can be very aggressive around new dogs or the ones that pose a threat to them. These protection dogs also get along with children, which makes them a wonderful option for a family protection dog. The American Staffordshire terrier is a highly energetic dog. They require daily exercise that includes running or walking. However, these dogs should never be left outdoor in extreme temperatures because they feel comfortable only in moderate weather. The best way to keep this dog happy is to take it outdoors for a run or play fetch with it. These dogs prefer spending most of their time inside the home where they can be around their owners. The Amstaff is an agile and strong dog that doesn’t have major health problems. They can live up to 12 – 14 years, which is a healthy lifespan. Some of the most common health problems that this breed comes across include elbow dysplasia, heart disease, canine hip dysplasia, and hypothyroidism. Many dogs from this breed also suffer from skin allergies. The American Staffordshire terrier is a strong dog that has a lot of love to give, including protection and companionship. Contact Command Control Protection Dogs to learn more about this breed and other protection dogs for sale.